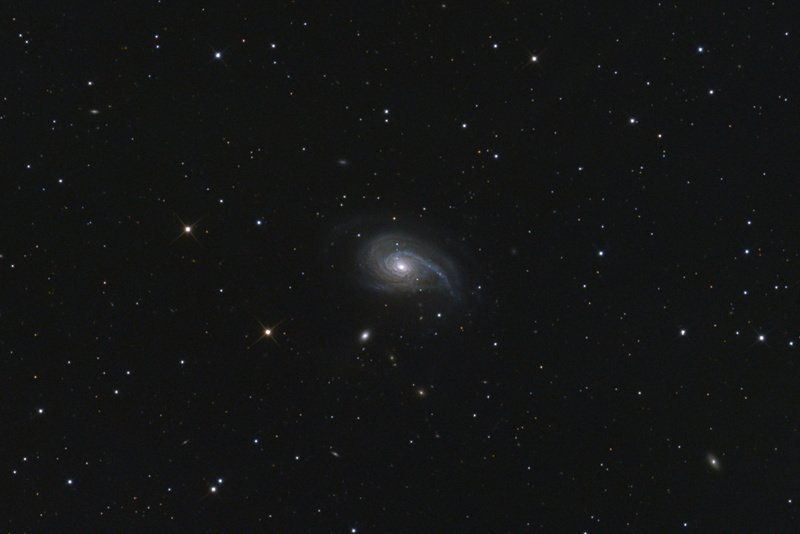 Object #78 in Halton Arp's Atlas of Peculiar Galaxies, also known as NGC 772, is indeed peculiar. One of its many spiral arms is much more developed than the others, due to the tidal forces of its close neighbour galaxy, the elliptical NGC 770. NGC 772 is an unbarred spiral galaxy about 115 million light-years from us in the constellation Aries. Its diameter is larger than 200000 light-years which is almost twice of the size of the Milky Way. The most prominent feature of the galaxy is the dominant outer spiral arm that is much stronger and more elongated than its other arms. Many HII regions and OB associations can be observed in the stronger arm, though the other smaller and more tightly twisted arms are well formed too, there are not many signs of star formation in them. Several satellite galaxies can be found around NGC 772, one of the closests is NGC 770 a dwarf elliptical galaxy that is thought to be the reason for the asymmetrical appearance of NGC 772. In 2003 two supernovae was observed in NGC 772, one only a few weeks after the other. SN2003hl was discovered on the 20th of August, and on the 8th of October the second was named as SN2003iq, both of them were of type II. The core of massive stars having more than 9-12 solar masses collapse at the end of their lives when the nuclear fusion in the core can't produce enough energy to balance gravity. The result can be a violent ejection of the outer layers of the star, while remaining material is getting denser and denser due to its own gravity, forming a neutron star or a black hole. Although not showing too much details in the pictures, NGC 770, the dwarf elliptical neighbour is also unusual. Its core is rotating in the opposite direction to its outer parts. The counterrotating core was not unusual if the galaxy was the primary galaxy in the region, but NGC 770 is a smaller satellite galaxy of the much bigger NGC 772. In astronomy at galactic scales distance is measured by the redshift of the objects. According to Hubble's theory, which is accepted by mainstream astronomy, there is a linear function between an object's distance and its redshift. Yet a minority of astronomers, including Halton Arp, do question the validity of the principle. They point at some phenomena that seem to contradict the theory. One of such phenomena is the material bridge between NGC 772 and a background galaxy. According to their redshifts, the distance between NGC 772 and the background galaxy is so big that gravitational force could not create such bridge between them. Similar phenomenon can be observed between Stephan's Quintet and a background galaxy. In 1980 a quasar (identified as [HB89] 0156+187) was discovered right next to NGC 772's core. The quasar's redshift was measured and its distance was calculated to be much farther than the galaxy. Hence, according to Arp, it does not seem realistic that a faint object like a quasar can shine through the most dense part of a giant galaxy like NGC 772. Answering these questions in the future can change the way we think about cosmic distances and redshifts.